Andrea and Kyle had a lovely beachfront wedding. Located in the beautiful Central Coast, CA, The Avila Beach Golf Resort was the perfect location for these two to tie the knot. Being right down the street from their house, this location held near and dear to this couples' hearts. Jake and Necia of Jake + Necia Photography were there to wonderfully capture all the excitement of this couples special day along with the talented Joel VanZ of Joel VanZ Outdoor Wedding Films. Enjoy! We officially met on Thanksgiving of 2008, but had seen each other and perhaps even met each other before that due to mutual friends. Although we are both alumni of Cal Poly, we have different reasons that have kept us grounded on the Central Coast. Kyle grew up in SLO and is surrounded by a large, loving family here. Andrea always liked SLO because of her time at Cal Poly, but it wasn't until after college, and when she met Kyle, that she truly fell in love with the area and the life she was about to create here. Fast forward 5 years, and we are now married and living together in Avila Beach taking nightly walks with our 3rd family member, our Brussels Griffon, Monkey. When looking at venues, we had a hard time finding the place that felt the most like "us"; when in reality, it was right in our backyard. 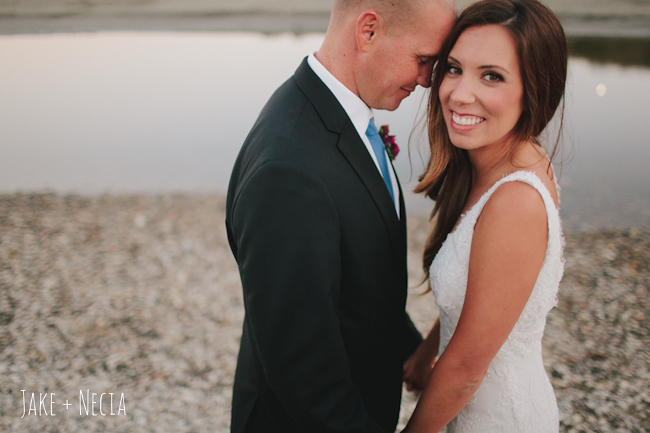 We love Avila Beach and knew that it would be the most fitting for us to tie the knot. When looking into vendors, most of them asked us to give words that we want to describe our event - what came to mind was: beautiful, beach-y, and classic. I (Andrea) love the look of watercolor and with the help of our amazing friend Narine, at Sweet + Crafty, we were able to tie that into all aspects of our wedding. The ceremony was officiated by Kyle's dad, Steve. This was the most touching and memorable moment to us because it was so personal and heartfelt. Another moment that stands out is when we were able to sneak away for sunset pictures. When we came back we stopped to take it all in and watch all of our closest friends and family having so much fun. It soaked in that "we did it" and it was now time to just enjoy the rest of the night and celebrate! Flowers (by Open Air Flowers): I originally thought I was going to be able to do all of the flowers myself. Luckily, I came to reality and was able to have Leslie at Open Air Flowers help create BEAUTIFUL arrangements for the tables, as well as the bridesmaids & wedding party pieces. Venue (at Avila Beach Golf Resort): Everything from open, bistro lighting they were able to create with the help of Kramer Entertainment, to the accommodating staff there to help us all night... they did a great job making us feel completely taken care of. Blue (watercolor), White, Black and Grey; with bright, tropical flowers! Jake + Necia: Our RAD photographers!! They helped us so much ahead of time to remind us of little things that we hadn't thought of, and when the big day came they were able to get the attention of family members and ultimately create the best photos for us to keep forever! Joel VanZ: Joel is so talented. Joel has worked with Jake + Necia many times, so their synergy during our wedding totally helped to get the best shots and create the masterful films we now have as memories of our wedding. Joyfully Joined Wedding Coordination: Mary Allegretta Butler = our life saver. She was a true professional and was able to come in late in our planning and really run the show. Her experience in the wedding and catering industry is beyond what I expected, and our big day definitely would not have flowed so smoothly if it weren't for her! Open Air Flowers: Leslie from Open Air created the most beautiful arrangements, bouquets and boutonnieres full of succulents, lilies and bright, tropical flowers. After giving her my (small) budget, I trusted her to create whatever she thought would look beautiful - and she definitely exceeded my expectations! Kramer Entertainment (DJ & Lighting): Melissa at Kramer was so awesome throughout our whole planning process. 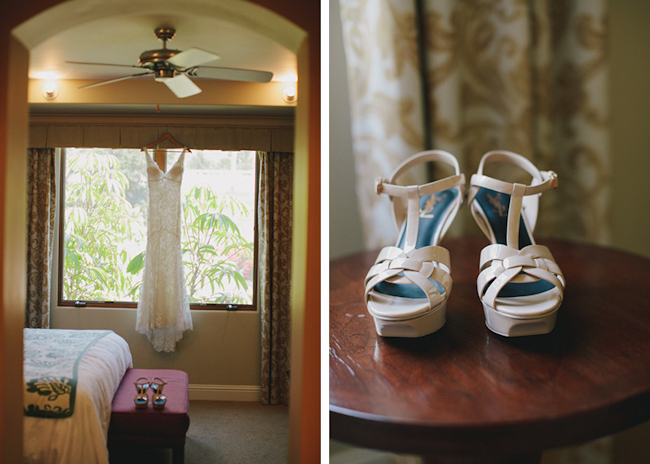 She suggested amazing vendors and worked directly with the resort on anything she didn't need my direct help with. It was great! Our DJ was Chase, and he was awesome! Figure out what means the most to you (i.e. to me was the venue, photographer and videographer), and go for it! I also chose the vendors who I felt I got along with best personality-wise (for example, when I met Mary of Joyfully Joined for the first time, I had complete confidence in her and trusted her completely with our day of coordination).